- The steady snow moves out Sunday morning with only a chance for scattered snow showers Sunday afternoon. Highs only in the 20's with lighter winds only gusting up to 30 mph on the ridges. - We should see a break Sunday night into Tuesday. Partly sunny skies with highs only in the 20’s and lighter winds. We could see a flake or two from passing clouds. - By Tuesday night into Thursday, another storm moves through. This storm starts cold but could have rising snow levels, as high as 7,500 feet at the height before falling. We could see another 2-4 feet of snow on the mountains, but a thicker snow quality. - Another cold storm working down the coast Friday through next weekend could bring several days of lighter snow showers with a few inches of snow possible each day. - The active pattern could continue through the week of the 18th. Watching the radar yesterday and last night, the heavier snow moved in a few hours ahead of the model forecasts NW of the lake. That brought a longer period of heavy snow, and then some of the heaviest bands of snow sat over the NW corner of the lake and Truckee last night. That hammered the ski resorts in that area with 3-4 feet of snow in 24 hours, the biggest 24-hour snowfall so far this season. 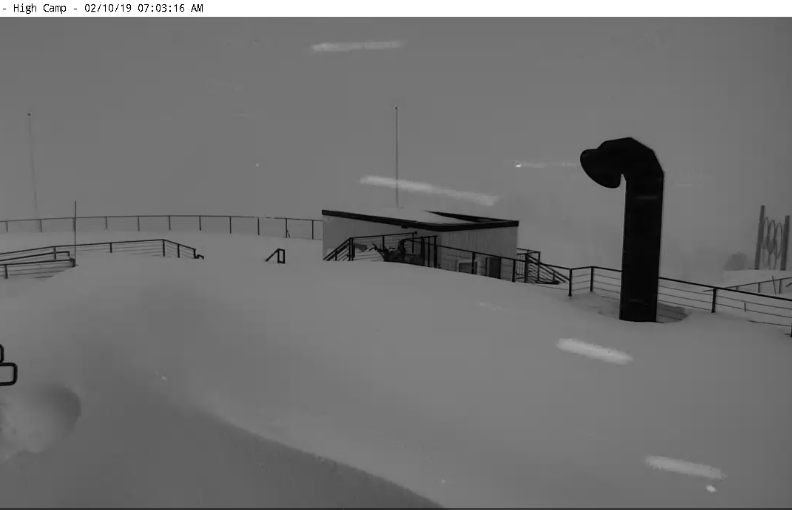 Here's a shot of the deck at High Camp at Squaw where they picked up 46 inches in 24 hours! Here's a snapshot I took around 7 PM last night of one of those heavier cells sitting northwest of the lake over Truckee. There was another heavy band across the south side of the lake overnight that hit Sierra across to Heavenly pretty hard, with reports from them of 37-42 inches in 24 hours. 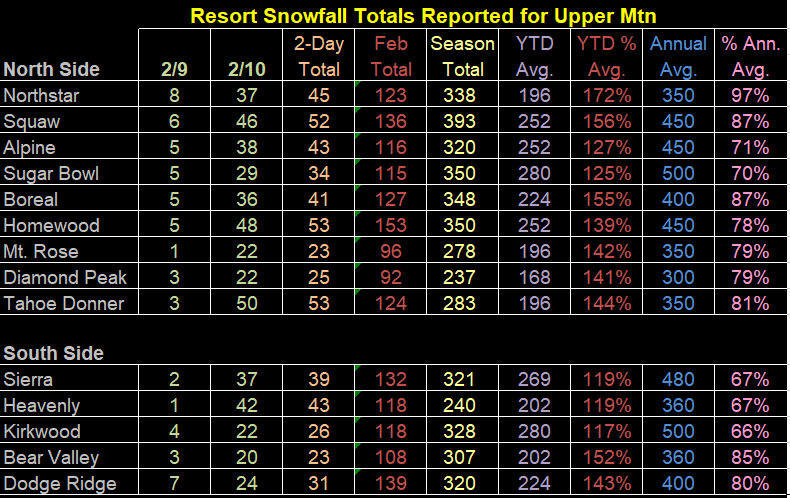 The rest of the ski resorts northeast and southwest of the lake picked up the forecast 24-hour amounts of 20-30 inches. 2-day storm totals now of 2-4+ feet. The last storm we had with reports this high was back on 1/11/17. The keep me honest forecast to actual report is ugly this morning. 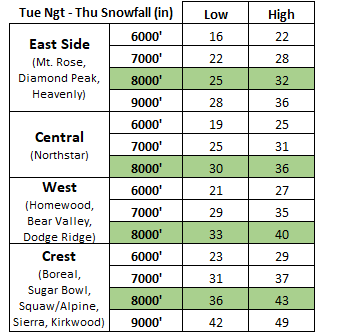 4 ski resorts are right on forecast, 3 to the NE and SW of the lake are under by 1-7 inches, and 6 NW and along the south side of the lake are over by 2-18 inches. Winds were gusting to 100+ mph on the ridges and to 50+ mph at lake level causing blowing and drifting of the very powdery snow, and whiteout conditions. That closed many of the roads by yesterday evening. 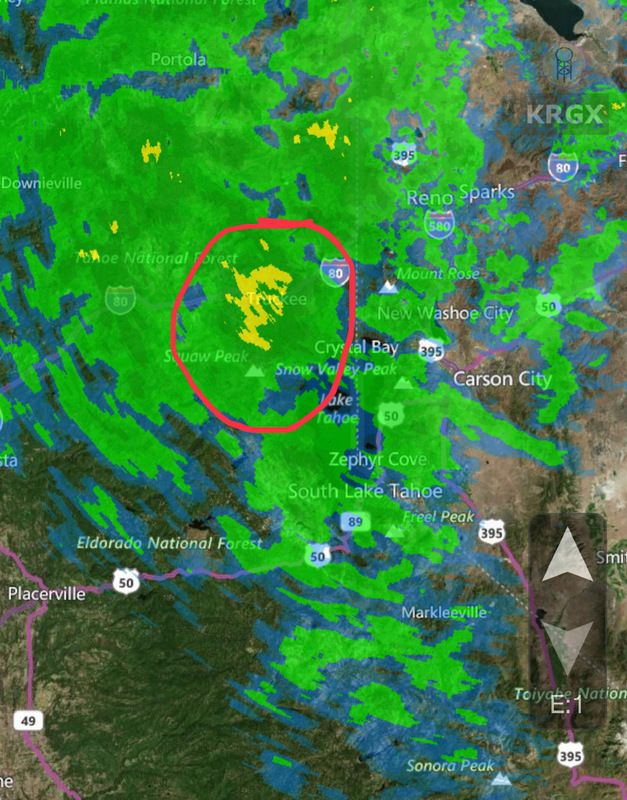 The back edge of the steady snow is pushing through the Tahoe basin this morning and will clear through by later this morning. Upper mountain wind gusts have dropped off this morning to below 30 mph. Only expecting scattered snow showers through the afternoon. A final 1-5 inches expected on the mountains today, mainly from the final bands moving out this morning. Most of the precip total falls to our south as the storm moves out. Once the roads are opened and the mountains dig out and perform avalanche operations, it should end up being a great powder day later in the morning or by early afternoon. The avalanche danger is very high. 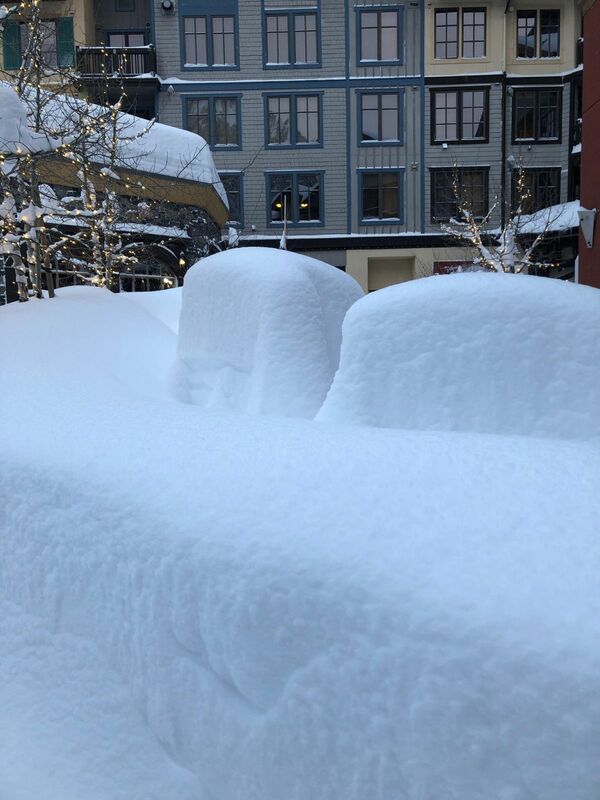 Squaw, Alpine & Sierra are closed for the day because of that. That's a sign a lot of other mountains will take a while this morning to dig out and perform the avalanche mitigation operations. Monday and Tuesday we should see some sun and lighter winds with highs only in the 20's. Passing clouds could drop a flake or two. This storm has been a pain to forecast. We still have the northern branch of the jet stream digging down the coast into Northern CA with cold air and cold storms dropping down from the Gulf of Alaska. 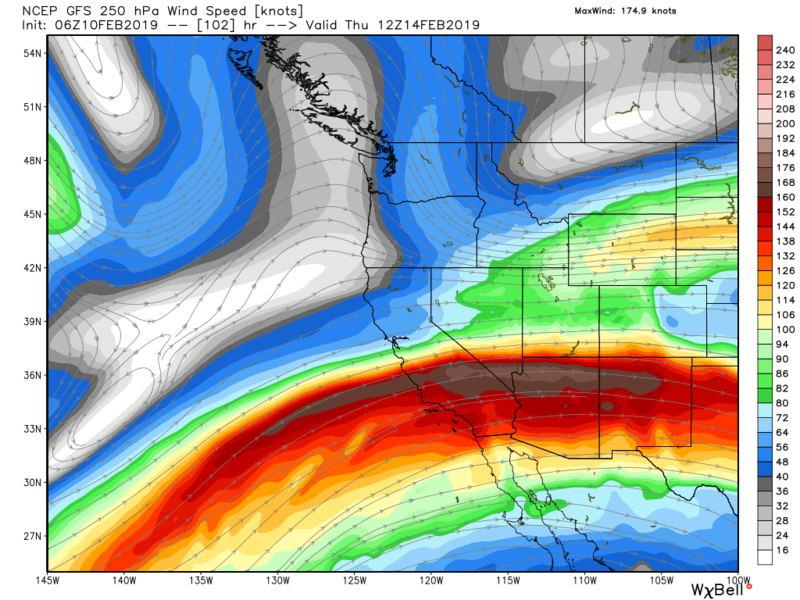 Meanwhile, we have the southern branch of the jet stream strengthening this week into Southern CA. 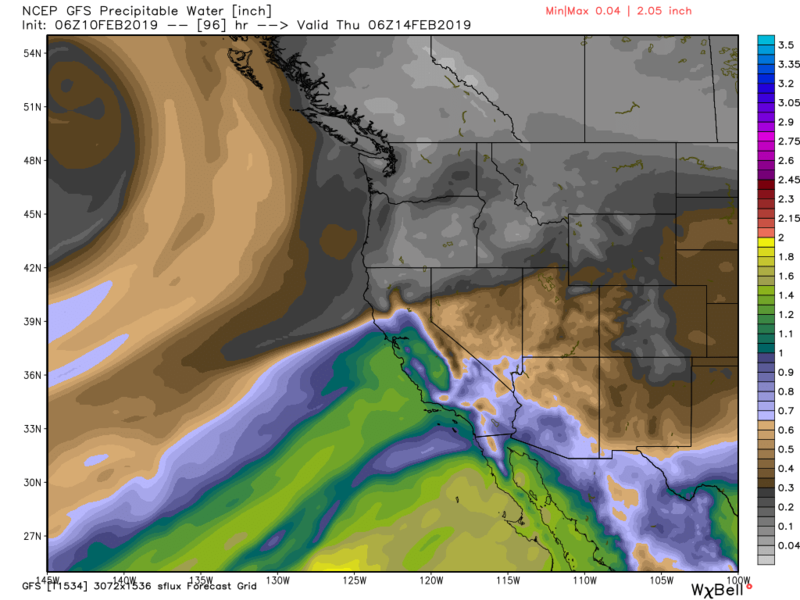 That is going to draw a lot of warmer subtropical moisture into CA by mid-week. The question has been how far north does subtropical moisture feed push, while the colder air is pushing down from the north? 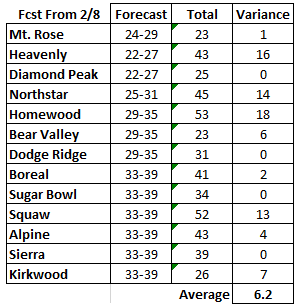 The forecast models have been all over the place with those scenarios. 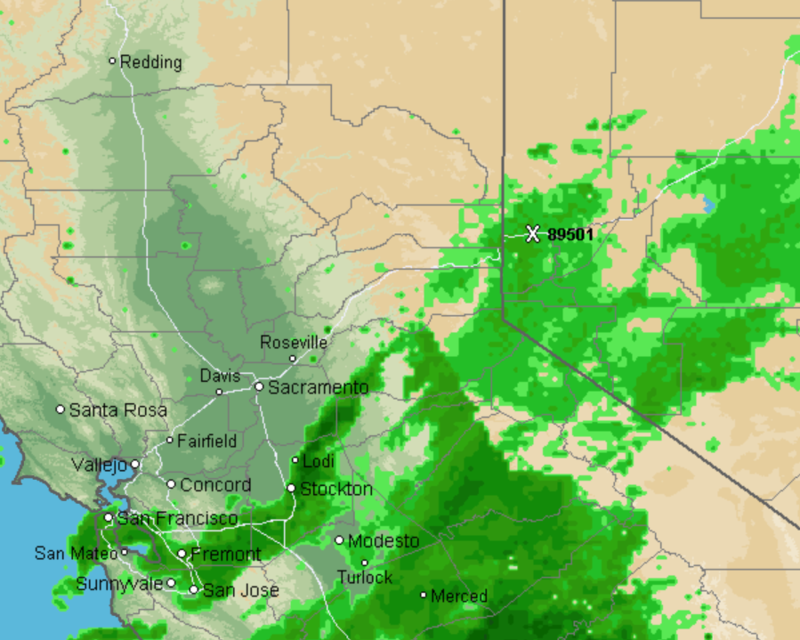 From a very wet storm with snow levels to 9,000 feet, and just a cold system for Northern CA and much lower amounts of precip. This morning there is a little more agreement among the forecast models. They are showing the next low-pressure system dropping down from the Gulf of Alaska, and slowing off the Pacific NW coast Monday. 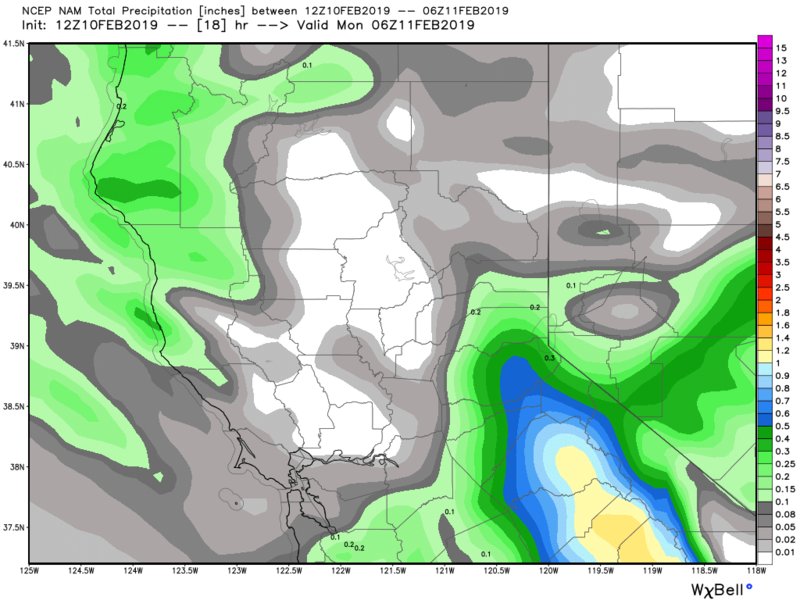 Then the trough continues to dig down off the coast and helps to direct the subtropical moisture feed further north into Central CA by Wednesday as seen in the image above. They are putting us right on the northern edge of that AR and then pushing it back south with colder air pushing back in Thursday. We start cold as the storm moves in Tuesday night with snow levels down around 4,500 feet. Then rising to 5,500 feet Wednesday. So we could have a big snowstorm down below lake level, with 1-2 feet of snow by Wednesday afternoon. Then we could see the warmer air work in Wednesday night into Thursday snow levels rising to 7,000-7,500 feet before falling later Thursday as the storm moves out. 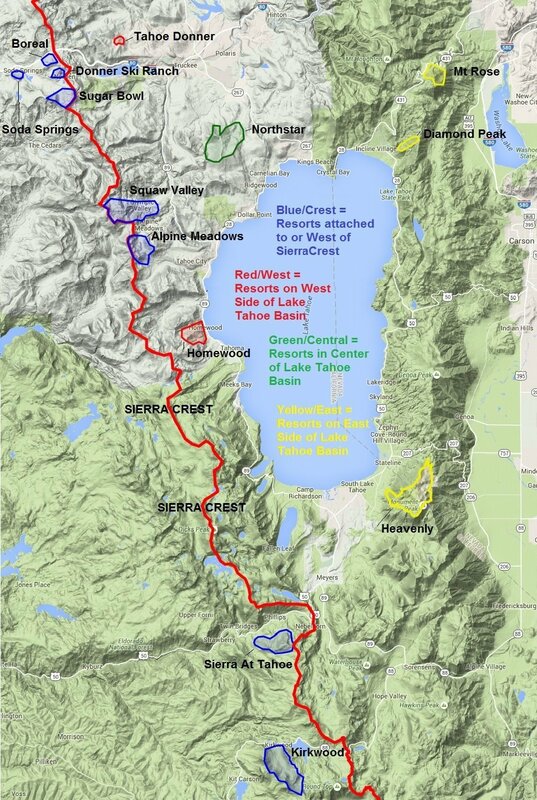 So we could see heavy rain at lake level and much thicker/wetter snow for the mountains. Ugh. We are still a couple days out so we will have to keep watching to get a better idea of how high snow levels could go. Heavier precip=higher snow levels, lighter precip=lower snow levels with this storm. 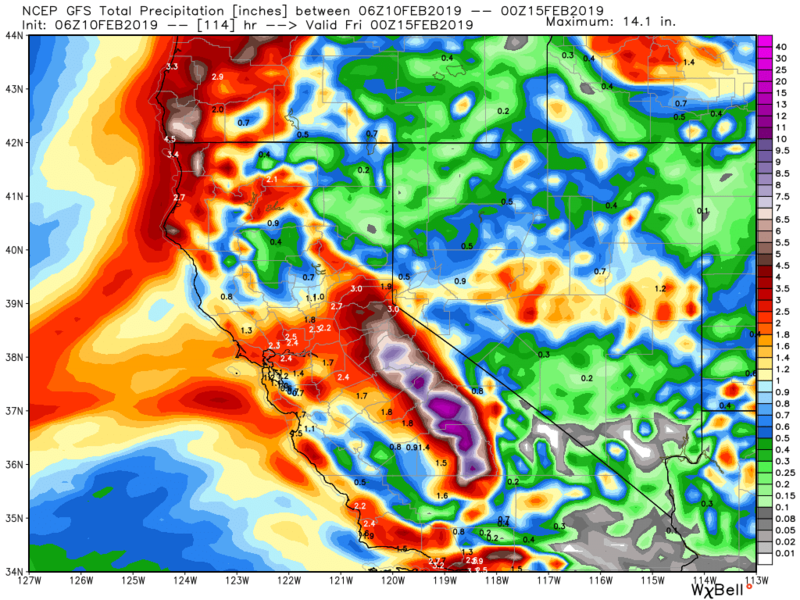 Here is a look at the total precip forecast through Thursday on the GFS. You can see the very heavy amounts to our South. Hopefully, the heaviest precip and warmer air stay to our south with snow levels maxing out just below lake level, and we don't trend the other way. Based on the latest model runs for total precip and snow levels, here is the updated snowfall forecast for this storm Tuesday night through Thursday. The cold trough digs down the coast again behind this storm. We could see a break later Thursday into early Friday with temperatures dropping back into the 20's. Then the next storm drops down from the Gulf of Alaska next weekend. The latest model runs show this system moving down the coast very slowly next weekend, with light-moderate snow showers possibly Friday night through Monday. On the 10-day forecast on the ski resort pages, you can see that I have a few inches of snow possible each day through Monday the 18th. The long-range ensemble runs on the GFS and European models are starting to trend towards the Canadian. 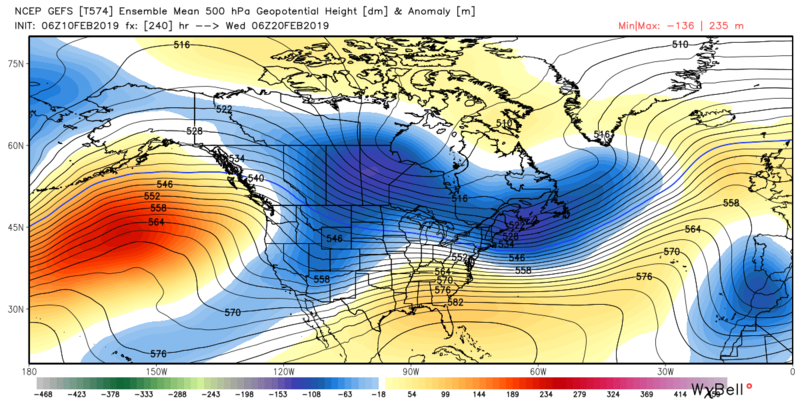 They are showing the ridge in the Northeast Pacific possibly shifting closer to the coast during the week of the 18th. This is something that I have been mentioning all week, as the pattern could begin to finally shift as the MJO (madden julian oscillation) begins to progress eastward again through the Pacific. We could see a brief drier period, and then possibly see the trough shift back over the West Coast later in the month if the MJO continues to progress towards Africa and the Indian Ocean.